Parties are fun, but it’s no secret that decoration costs can easily pile up. Your excitement about throwing parties can diminish when you realize how expensive party decorations can get. 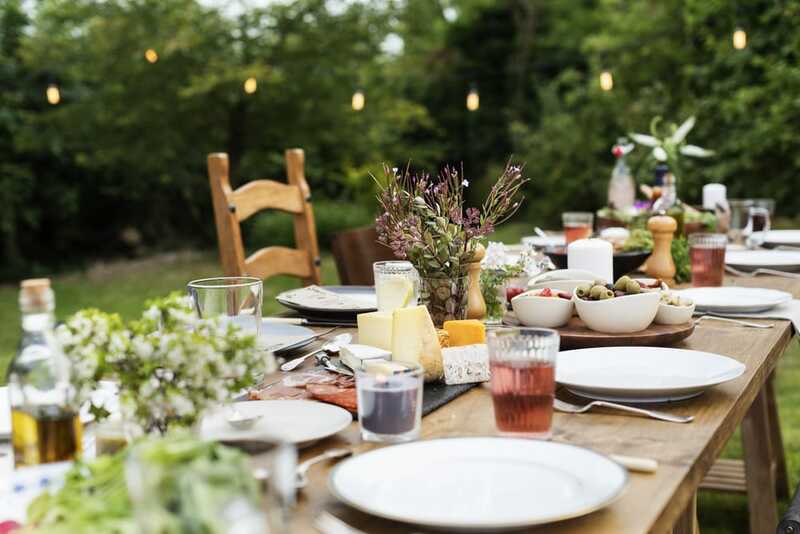 To ensure that your party plan moves forward, it’s recommended to try out some inexpensive ideas that can help you throw a memorable party without breaking a limited budget. There are many creative ideas out there that involve a bit of DIY work offering a rewarding solution to decorate any type of party. Don’t worry about minimalist-looking ideas, as there are more complex decorations out there that are fairly economical. 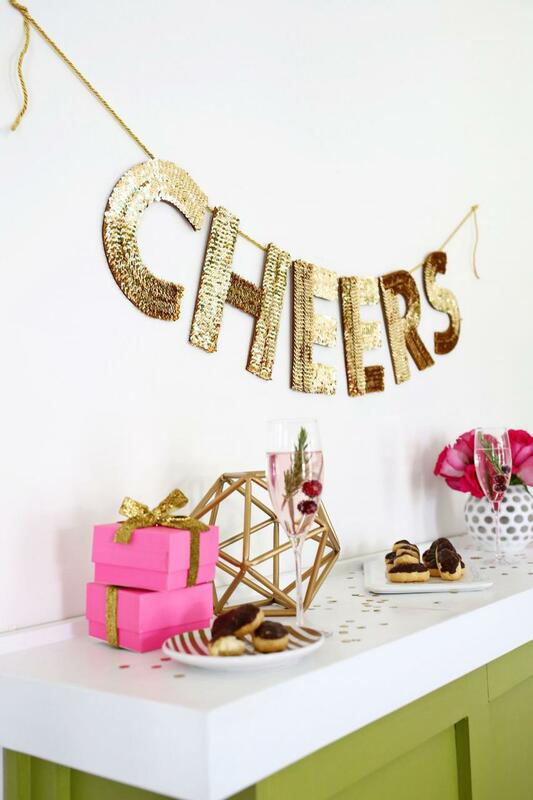 Learn how to add some glitz and glamor to your fun party using this list of inexpensive decoration ideas. One of the easiest ways to deal with decorations for a party is to let nature do the talking. There’s no need for complex enhancements when you’ve got a natural backdrop that offers a great decorative effect already. With some nice seating options and a table, any outdoor space can be transformed in the perfect spot to host a party. Extra décor items might feel unneeded if the natural beauty of the surroundings is particularly impressive. Candles allow you to add some quick party vibes without spending a fortune. Sometimes the atmosphere needs only a touch of extra intimacy and that’s precisely what candles can achieve. 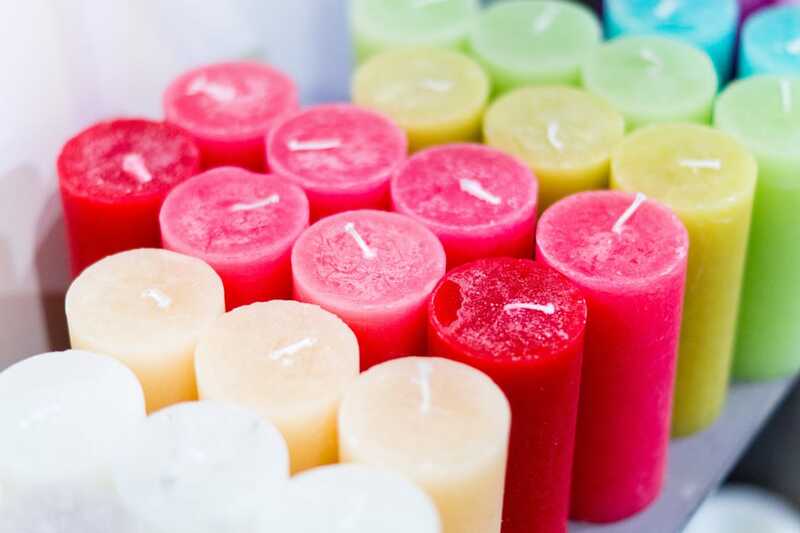 Go for different sizes and heights to create a more fun impression when choosing candles. More lighting around food areas can definitely improve the overall ambiance. Consider a scented candle like this one from Amazon if you wish to act upon the sense of smell as well. Balloons are standard additions for any party. Choose more colorful styles if there are more youngsters at the party and stick to a limited color scheme for a mature look. 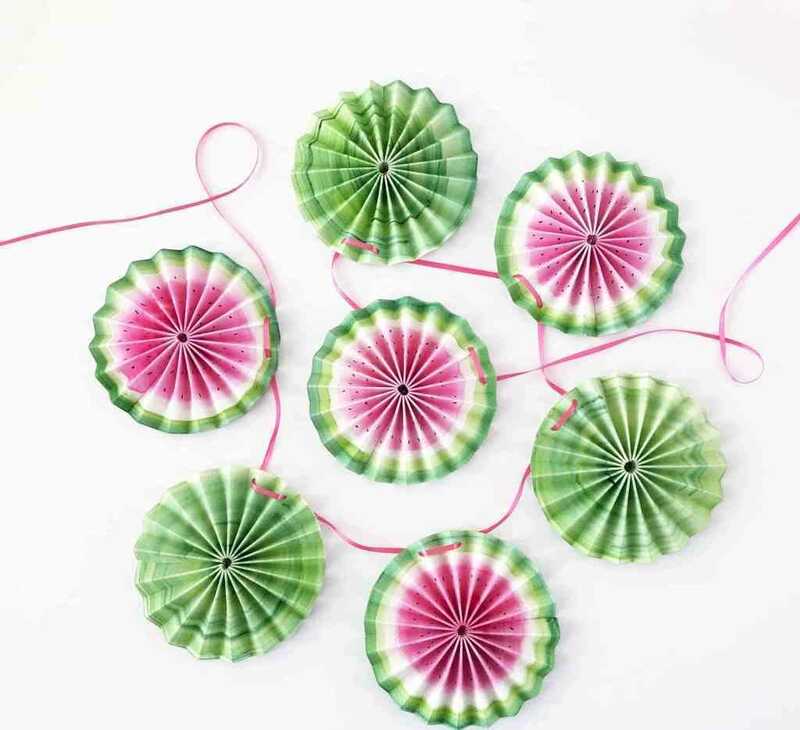 Making balloons pop can be fun and you can decorate with their help while respecting a stricter budget. To add some extra excitement for children, fill the balloons with confetti. 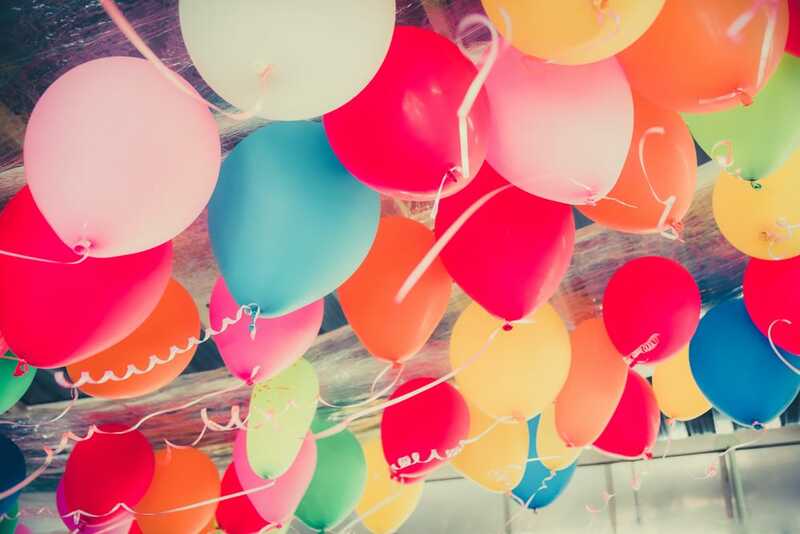 Use balloons to decorate the ceiling or scatter them on the floor. There are many decoration possibilities, including the use of fun-shaped balloons. Personalizing birthday parties is a breeze with the help of balloons that can be customized with particular phrases or specific numbers. Check out these letter balloons on Amazon. The food at the party can easily turn into an important highlight. It’s just a matter of learning how to properly showcase the menu. One great option is to rely on a decorative buffet. You don’t need to invest a lot of money on something too fancy. 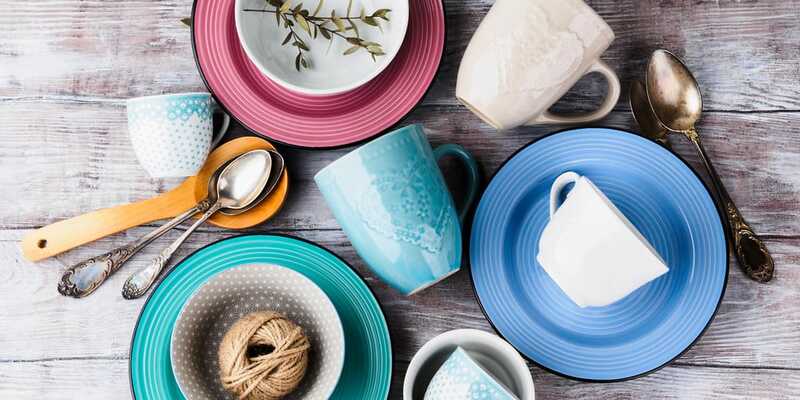 There are pedestal bowls on the market that are fairly cheap, or you might try your hand at a DIY project and craft something similar using melamine bowls glued to candlesticks that have been freshly painted. You can save money and forgo expensive dishes while focusing on some effective decorations to elevate the buffet. Are you looking for a frugal solution for expensive dining tables? One quick solution that we think it’s appropriate for more casual groups represents the use of floor pillows. 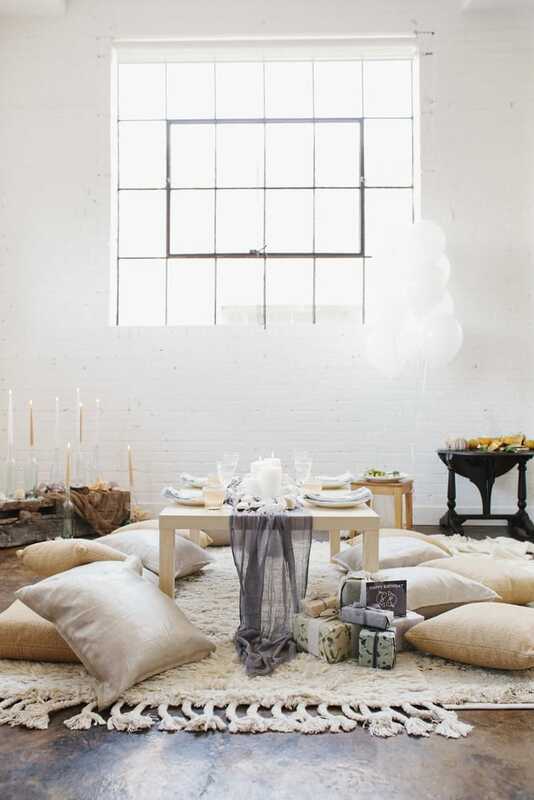 Crafting a party space on the floor might seem weird for some, but it can be fun when done right. A simple table and plenty of floor space like it’s shown in this picture should be enough to create an intimate atmosphere. 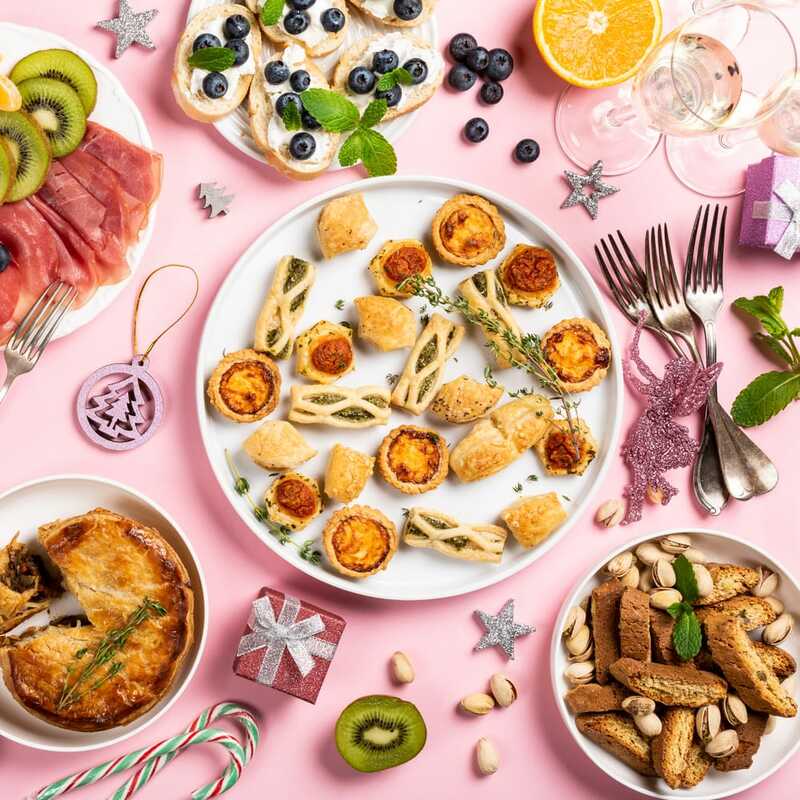 This kind of party scheme seems suitable for enjoying small finger foods and cocktails. That can often translate to reduced costs on fancy dishes. Some people worry about hosting parties and not having enough matching dinnerware. This problem can actually be used to your advantage if you learn to embrace the mismatched elements and create a decorative effect. 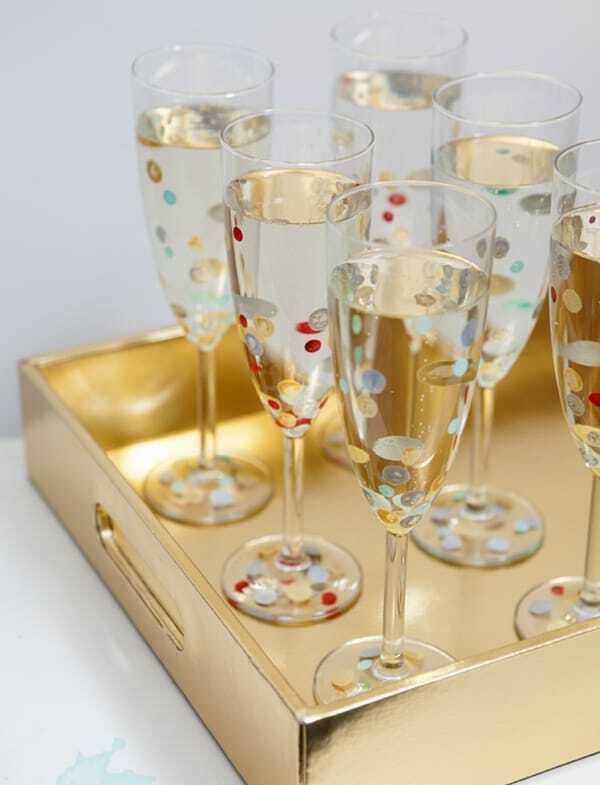 Mixed stemware, plates, and other accessories can add some interesting qualities to the party. Colorful elements like satin ribbons or cloth napkins can be included as well to bring in some extra texture and contribute to the fun atmosphere. What kind of party is that without flashy colors that inspire joy and liveliness? 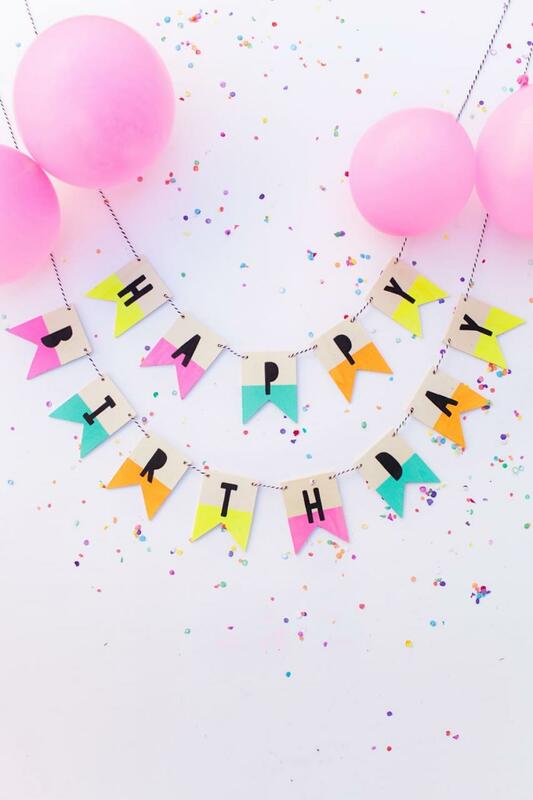 If you want your party to be successfully decorated without spending too much, there are many resources that can help to bring in a much-needed pop of color. One simple example is to purchase paper goods and confetti. 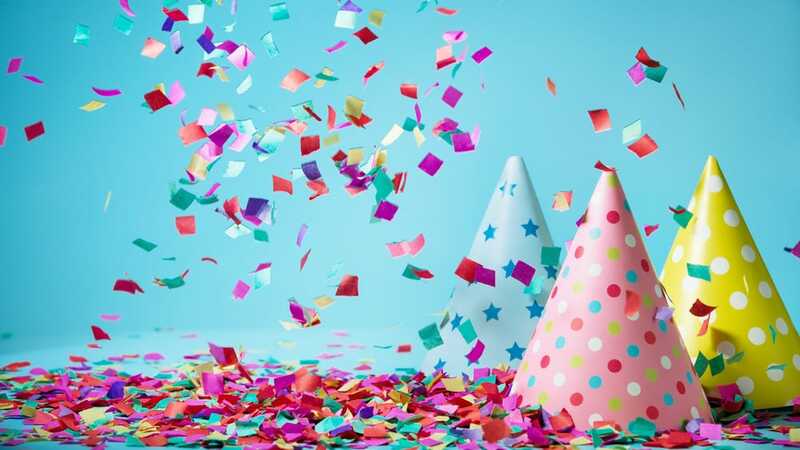 If you don’t want to leave off too much waste after the party, perhaps it would be a good idea to look for used party decorations that can often be acquired for free. Websites like Craigslist or freecycle.org are solid places to start. If you’re hosting an adult party, sticking to a monochromatic color palette can be a smart solution. Not everyone is a fan of bright colors and decorating with a white theme is often cheaper than other options. Buying quality linens can get expensive so consider renting them if you want to impress your guests. Before that though, look through fabric stores for cheaper materials that you can use instead. Some great alternatives are burlap or muslin and these can make solid decorations for parties in the form of table runners or napkins. An inexpensive way to add some colorful vibes to the party is to bring in some stylish floral arrangements. Fresh flowers have the ability to brighten up the room with their lovely textures and vibrant colors. There’s no need to spend a lot of money on some grand floral arrangements as even some smaller bouquets can do the trick. Some small vases and a few blooms could be all it takes to improve the ambiance with the refreshing touch of flowers. 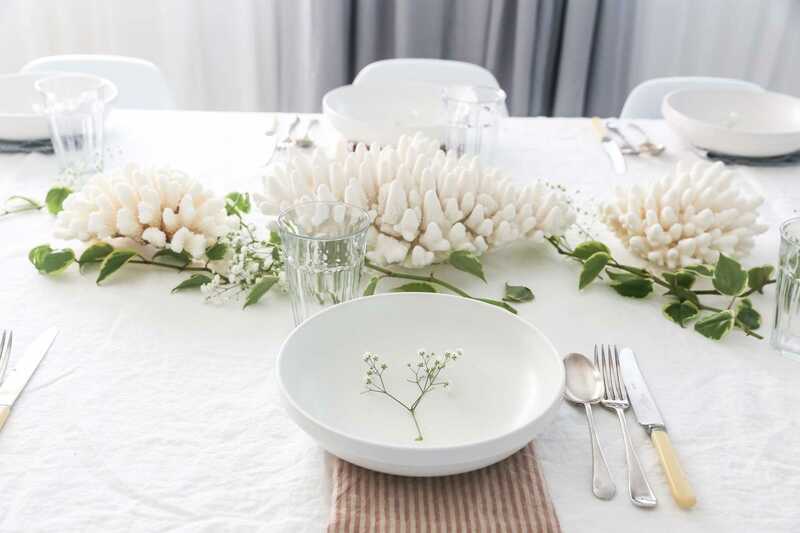 Dressing up a casual dinner party can be even easier if you have some fresh flowers you can use in the backyard. DIY projects will often provide you with some great decorative opportunities while keeping costs down. 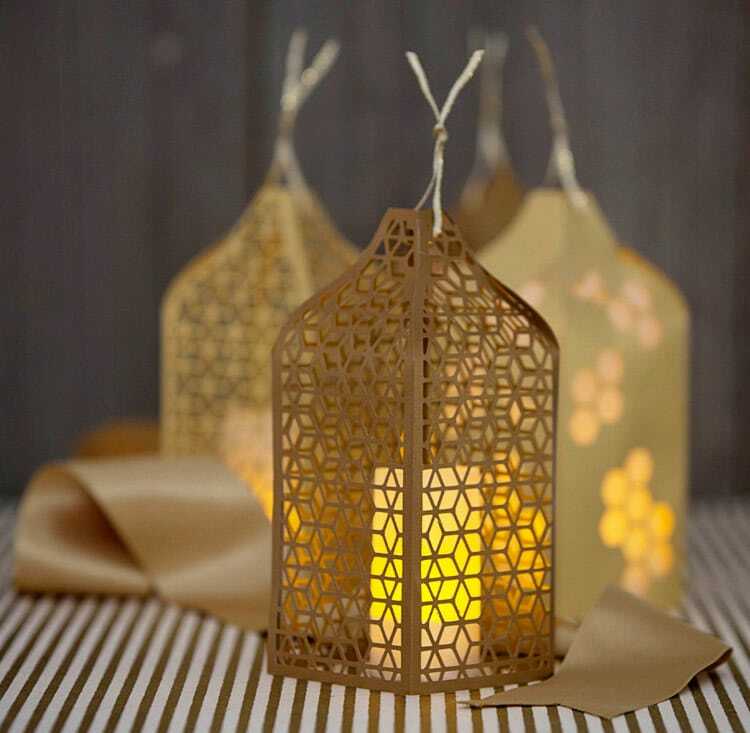 This papercut honeycomb lantern is a nice example given its eye-catching gold design. It can find its way besides other decorations at your party. You can find all the details here, including the project file to cut it by hand or with the help of a machine. 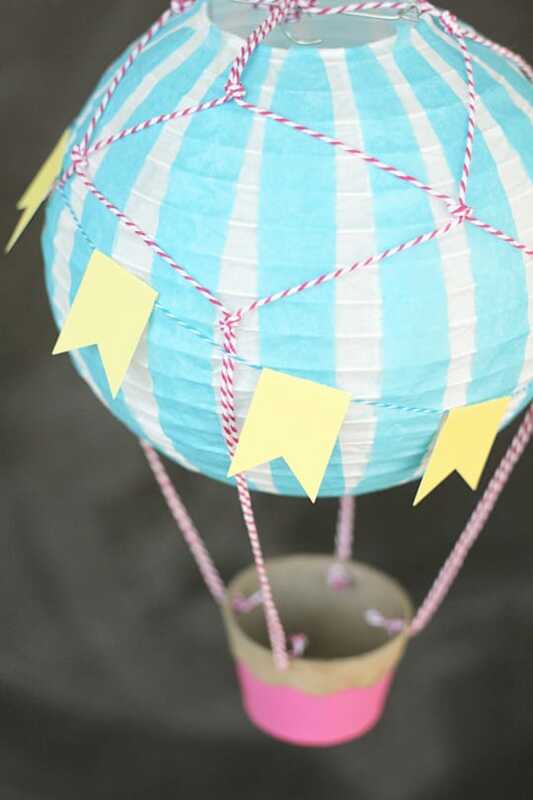 Given how inexpensive the materials are, you can easily make multiple paper lanterns. Garlands are simple and inexpensive to make. They can be highly versatile in terms of party decorations. In this DIY project, you can use them as a cake topper to make a celebration more special. This is great for those kinds of events that aren’t too specific when it comes to messages that you wish to transmit. The garland cake topper can make any get together more fun and exciting. It adds some colorful vibes that fit well with the festive theme of a party. Any cake can take advantage of this simple yet effective facelift. Another cheap decoration idea you can try to make your parties livelier is this DIY painted bottle project. 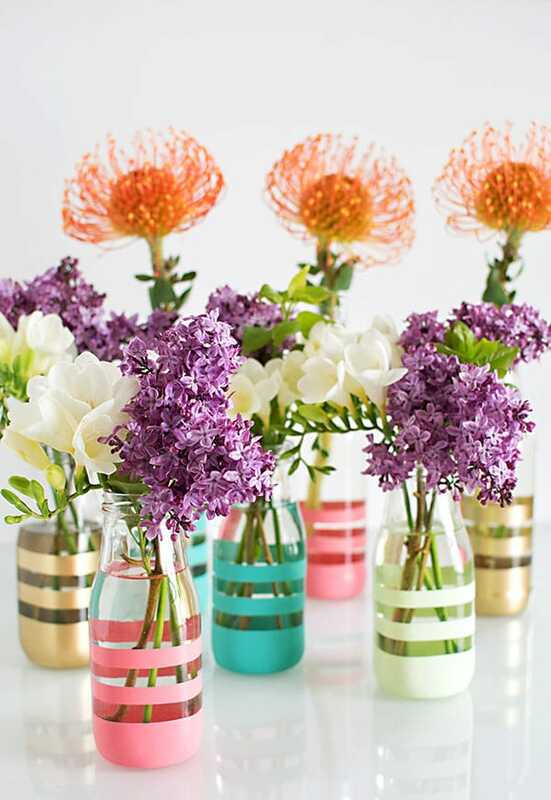 You can create some unique-looking vases in different colors without too much effort. The best part is that you will also recycle bottles in this way making for an eco-friendly decoration idea. With the right spray paint, you can add some cheerful vibes to any party. Decorations that you make yourself can often have a greater impact when it comes to preparing for an important event like a birthday party. Take a look at this simple project for a tassel garland that will steal the show at your next party. One of the main advantages of this decoration idea is cost-effectiveness. With minimal investment, you can delight your guests with a unique decoration that can be placed anywhere in the house. If your party area is larger, you can easily make more of these garlands and scatter them throughout the place. 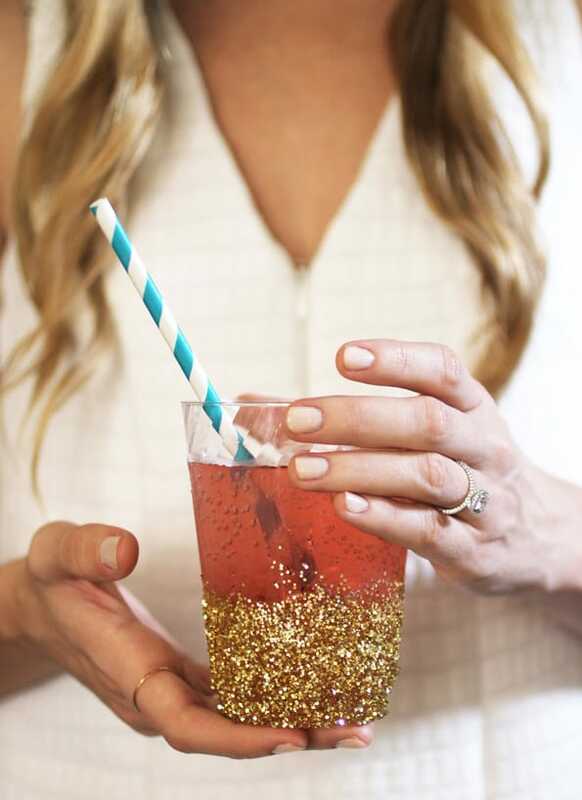 Here’s a fun idea to add some glitz to the beverages at the party. Cocktails will definitely look more attractive if you use some glitter-dipped cups. The project for this decoration is fairly easy to try and only requires some gold craft glitter and spray adhesive. Check out the full details of this idea if you’re interested. We’ve mentioned the importance of bright and cheerful colors to include in your party. Here’s another method to add some welcoming splashes of colors to the scene of the party. 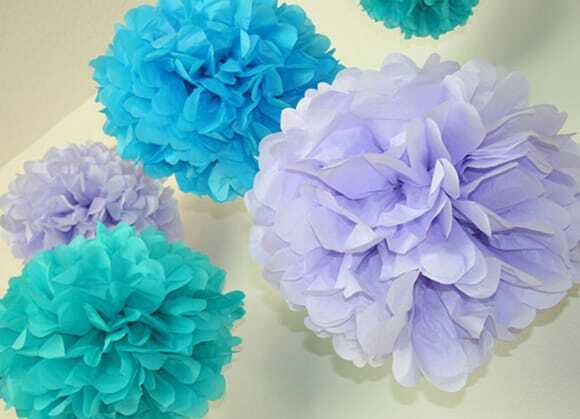 You can make pom poms from tissue paper without spending a lot of money. The only downside is that this is the kind of time-consuming DIY project that needs to be prepared ahead of time for the party. 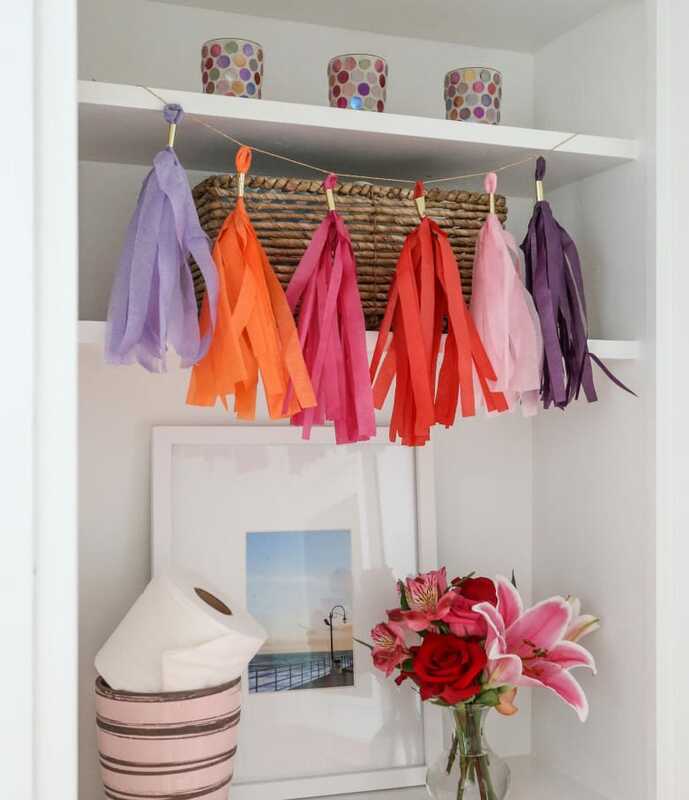 If you choose to go through with it, all that effort could be worth it in the end as the colorful pom poms are amazingly versatile. You can easily integrate them in a wide range of events and parties. 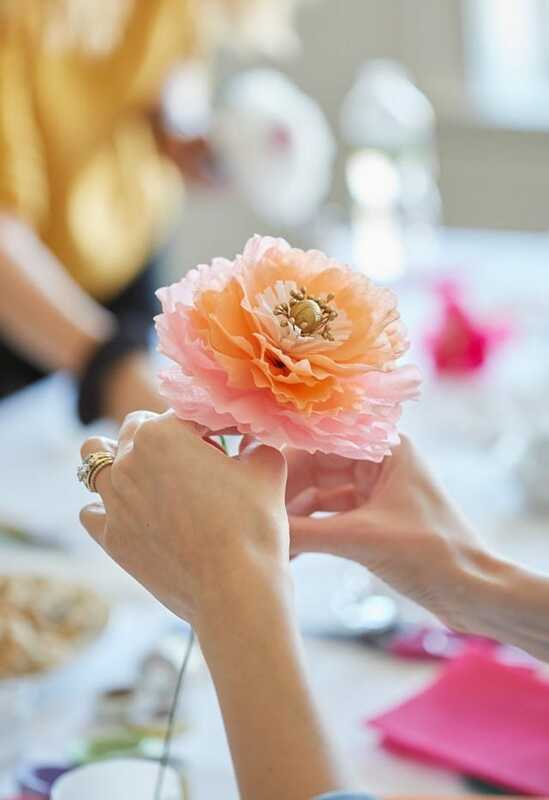 Summer parties require fitting decorations to enhance the festive mood of all the guests. Check out this watermelon banner project that’s fun to craft and refreshing to display anywhere at the party. There are lots of paper garlands you can try, but this seems like an ideal choice to add those summertime vibes. 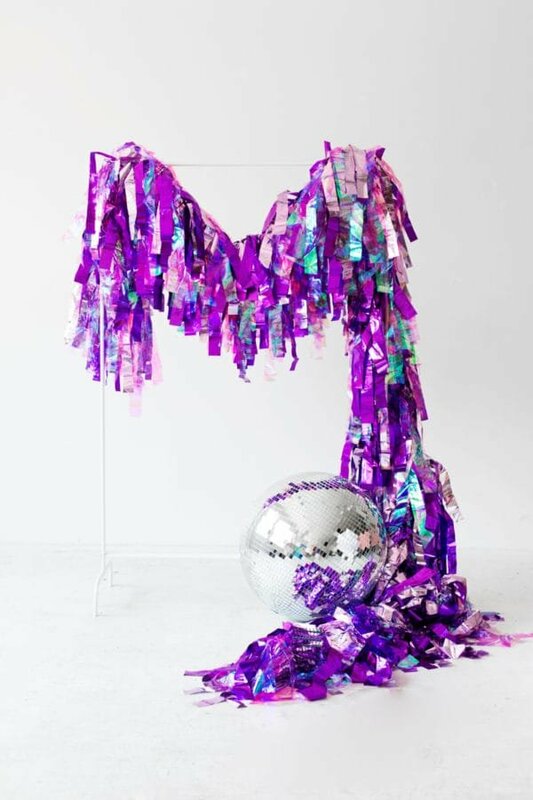 Another idea for fans of sparkly decorations, the sequin letter garland DIY project can make a bold statement at any party. Despite how complicated it may seem, this garland can be crafted without too many hassles. The supplies for this shouldn’t affect your budget. Check out the full tutorial here if you want to add some glittery pizazz to your next party. Using plain white plastic flatware at a party doesn’t feel too exciting. 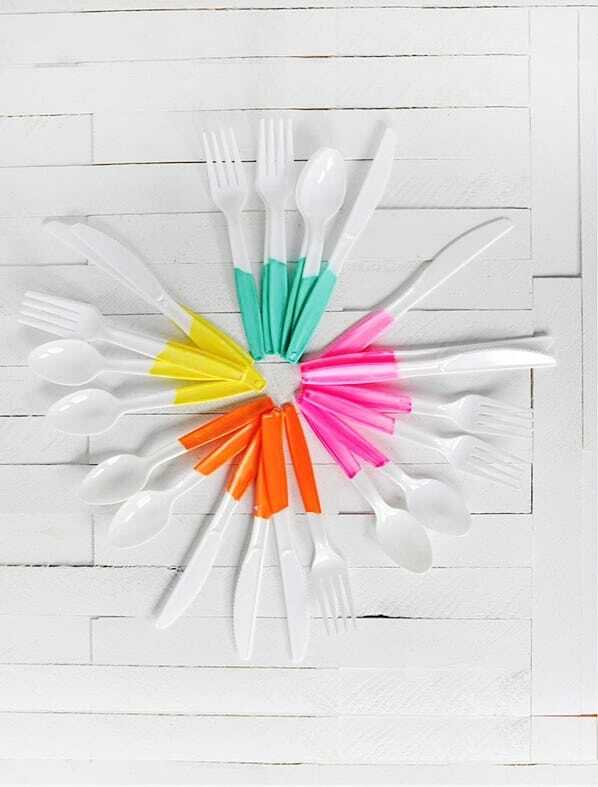 Making your plastic spoons and forks more fun and special can be done with a splash of colorful paint. This project is very easy to try and won’t require you to be cautious about painting as you don’t have to worry if the process is dishwasher safe. Your entertaining efforts deserve some embellishments to keep everyone’s moods in high spirits. These glasses are decorated with creative polka dots which look very impressive compared to the amount of effort needed to paint them. There aren’t many supplies required to make this DIY project and the best part is that you don’t have to worry about dishwasher issues. Here’s an interesting idea that can help you make clever use of popsicle sticks. Glue them together and add some splashes of paint to create a table runner with a unique look. This could be an excellent choice if your party theme involves the use of sweets and lots of colorful elements. Because painting every stick individually would take way too much time, it’s recommended to go for the splatter painting method. 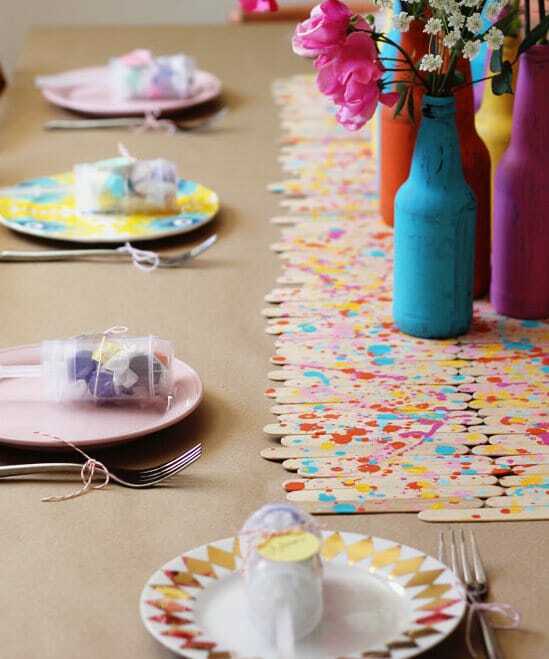 The result speaks for itself as the gorgeous design of this DIY table runner fits the party theme very well. 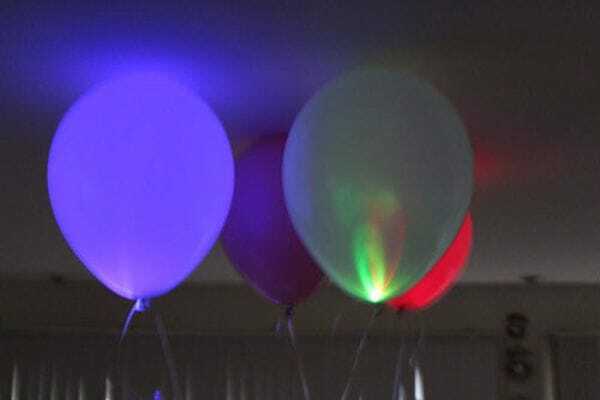 If you want to throw a truly mesmerizing party with decorations that stand out from the crowd, you’ve got to try this DIY LED balloons project. It makes use of classic party elements such as balloons while giving them a fresh twist by pairing them with LED lights. The resulting effect can be best described as instant glowing lanterns. LEDs can be crafted by yourself, but we recommend a simpler solution to just purchase them. Find all the assembly instructions here if you’re interested in spicing up the look of the party with glowing balloons. Buying streamers is fairly simple to do even if you’re on a budget, but if your party needs a more custom look, crafting your own sounds like a better idea. With the help of some friends, this decoration project is a breeze to accomplish. The party streamers can be hanged in different styles and regardless of the way you choose, they will make a big impact. 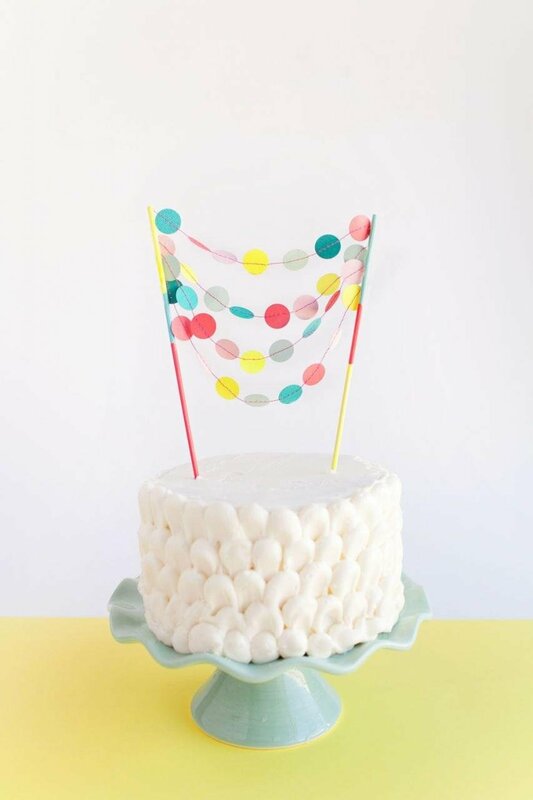 Instead of twisted streamers, consider a more elegant option for a party backdrop. 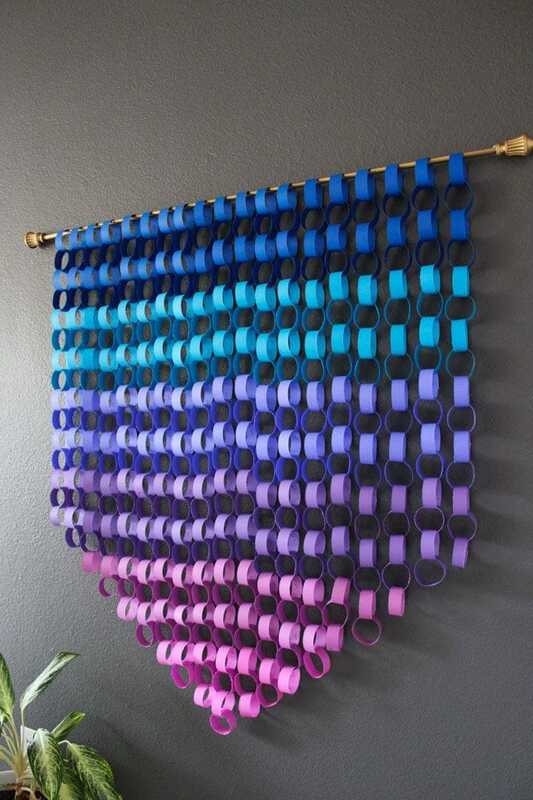 This paper chain wall hanging seems like a good choice due to its stylish ombre effect. Even though materials used for this DIY project are often found in kids crafts, the look of this decoration gives off some modern and sophisticated vibes. 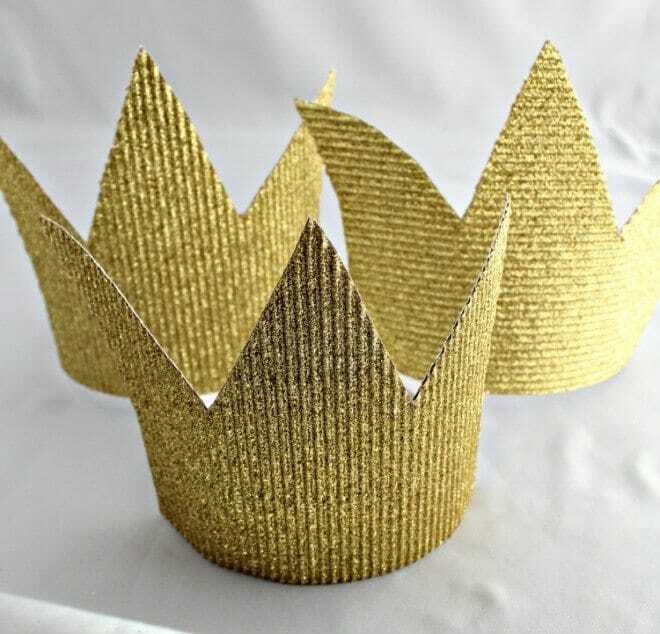 Those searching for some lovely party favors for kids should check out this DIY project that consists of golden crowns. They can be built easily and made to withstand children parties. We also like their versatility as you can make use of them for other events as well. Take a look at the full tutorial here to get this creative project right. Fresh flowers are beautiful additions for parties, but sometimes you need decorations that can last for a longer time. 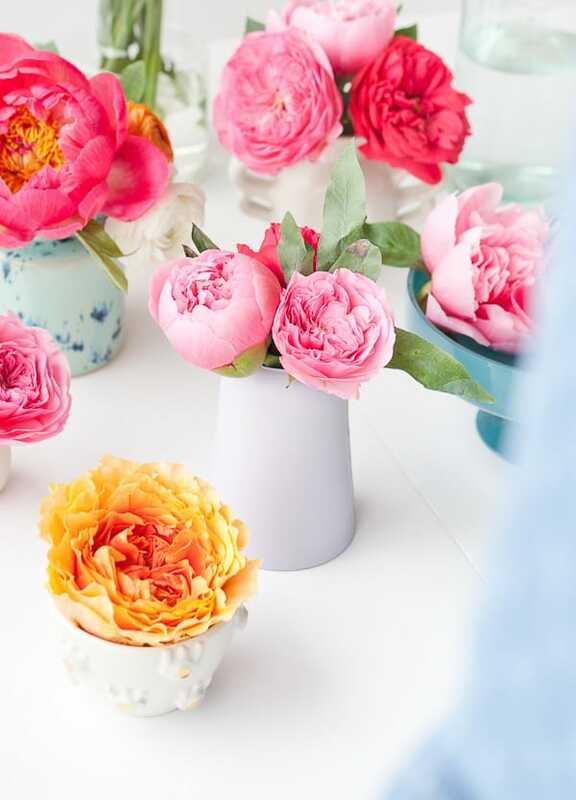 These magical peonies made of paper can be used to decorate any party regardless of the season. They simulate the natural beauty of flowers quite successfully and require only a minimal investment. Here are all the details of this decoration idea. To create the best resemblance to their real-life counterparts, these paper flowers should be crafted using colors inspired by real blooms. If you want to get more creative, you can incorporate some unexpected colors that are not usually found in nature. Add wilder patterns and shapes for a fantasy look if that suits the theme of your party better. Any successful party needs decorations that have a more profound visual impact. 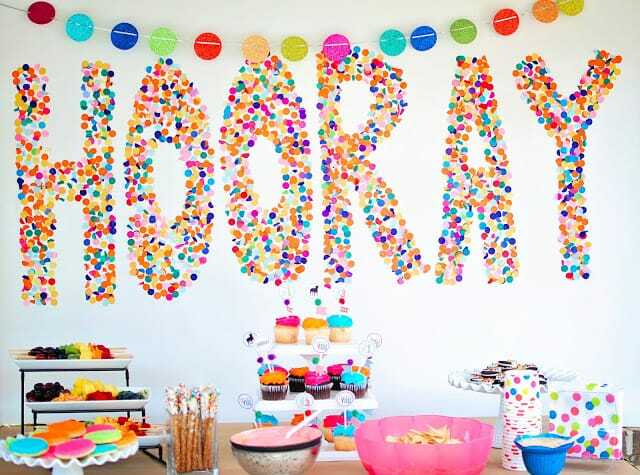 One of the easiest ways to do that is with the help of a vibrant backdrop such as this one made of colorful confetti. You can add your own message for a personalized look. This could be an excellent decoration idea for budget-conscious people willing to put some effort into a DIY crafting project. Find the tutorial here. Here’s an inspirational décor idea for a vintage-themed party. This hot air balloon is made using common supplies and can be customized in various ways to add the desired visual effect. You can even incorporate a simple LED light to boost its functionality. This is a fun project to try that even novices should be able to handle without breaking the bank. Check it out here. What kind of party is that without delicious desserts? If you’re looking for a more innovative way to display your cupcakes, here’s a solid idea that involves crafting unique-looking stands for them. 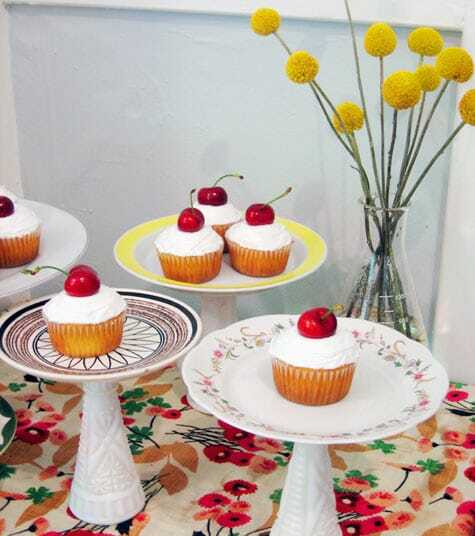 Instead of buying some bland models on the market, you can recycle old plates and vases resulting in a superb stand for cakes and other desserts. There’s a bit of work that needs to be done, but the good news is that you can also use the opportunity to add some personalized touches on the new cake stands. One issue that many people experience when it comes to inexpensive party decorations is that you will often end up with lots of items that you can’t use for too long. Here’s one idea that’s versatile enough to be used in multiple ways for a long period of time. This wood party banner is especially recommended for those who seem to go through party supplies way too fast. It costs very little to make and the result can be fabulous for any kind of event, including birthday parties. 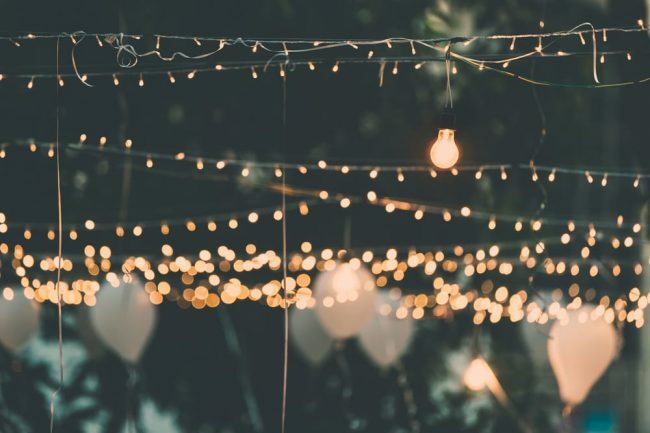 Some of the cheapest decoration ideas are also some of the most creative and eye-catching to breathe some new life to the atmosphere of the party. 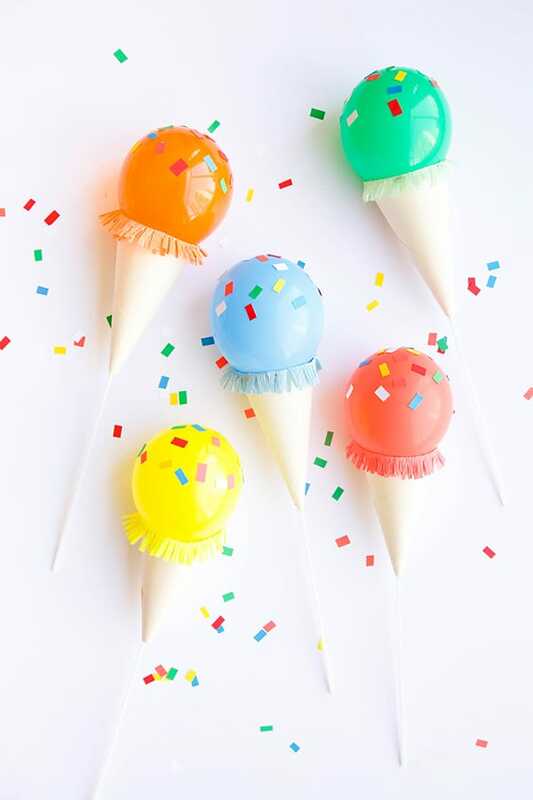 These ice cream sticks that use balloons as cones can easily become centerpieces for any kids party. The great news about this decoration idea is that it won’t be difficult to craft it. If you’re throwing a party with an ice cream theme, this is sure to be a sweet decoration to include. The full tutorial with all the essential details can be accessed at this link. Bringing in a touch of color is relatively easy to do when it comes to decorating for a party. When you’re doing that in a more interesting way, the colorful effect can be greatly amplified. 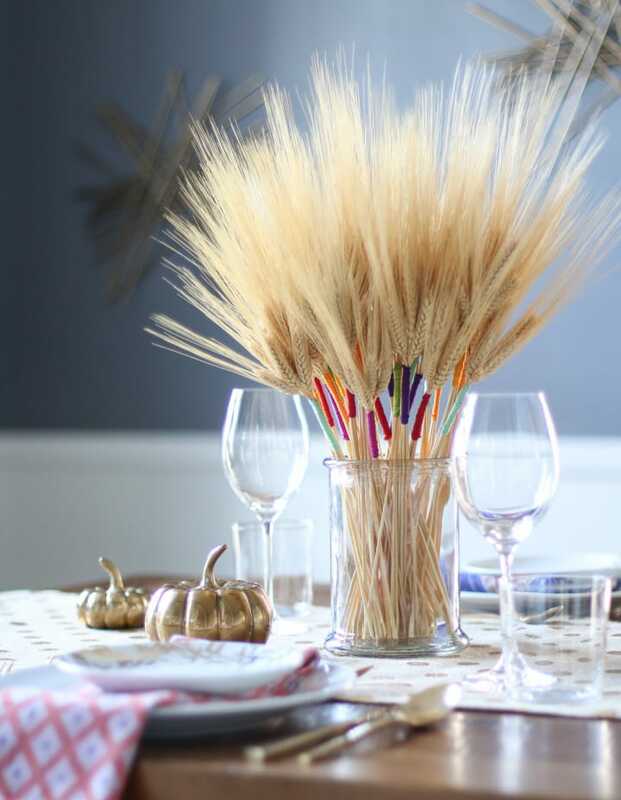 Here we have a DIY project that makes use of dried wheat stalks that have been embellished with embroidery floss in a multitude of colors. This is the kind of inexpensive and basic decoration idea that’s incredibly effective as it combines modern and traditional styles so beautifully. It represents a pretty way to tie all the party decorations together. A nice example of using this decoration is to let it be the main focus of the dining room table. Ice cream decorations are very popular options for summer parties. 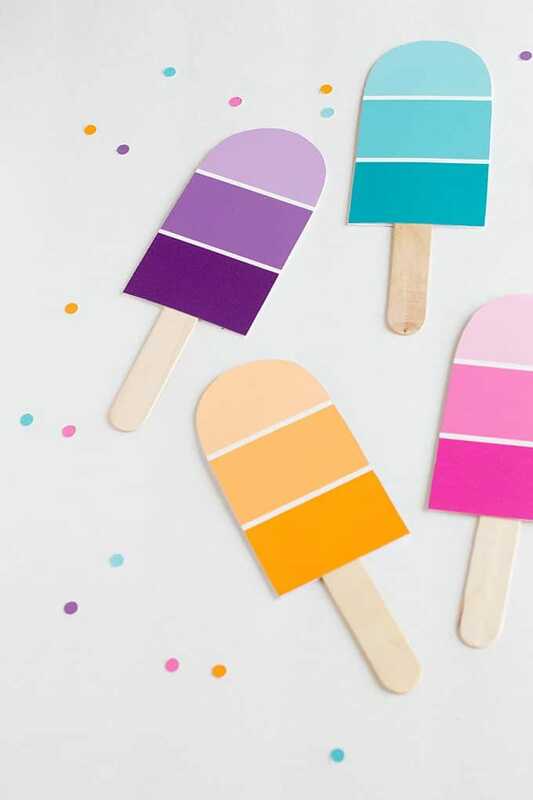 Here’s one great solution to throw a more creative popsicle party with the help of these DIY invitations. This project can be handled in a matter of minutes and you won’t be spending too much money. Kids will love these popsicle crafts in particular given their fun designs. Another fun idea for a charming summer party is to incorporate some fruity balloon straws. You can make just a single relevant fruit balloon like an orange for an orange juice, but the visual effect is more impressive when you assemble an entire bouquet of these straws. This DIY project is easy to try and can be adapted for your specific event. The juice seems to taste better with the help of these colorful embellishments. 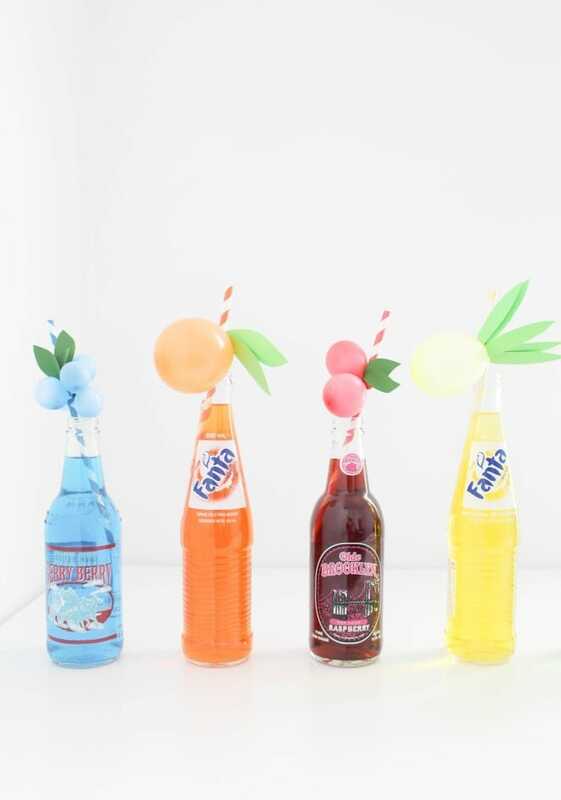 Fruity balloon straws are able to create a more cheerful atmosphere for any party. If you want an eco-friendly alternative to paper straws that can often disintegrate in drinks, try out some metallic straws like these ones from Amazon. They’re quite inexpensive considering you can reuse them for other events without problems. You get cleaning brushes with the metallic straws and they are completely plastic-free. The best part is that you can purchase these straws in a wide range of colors from gold and silver to black and rainbow styles. 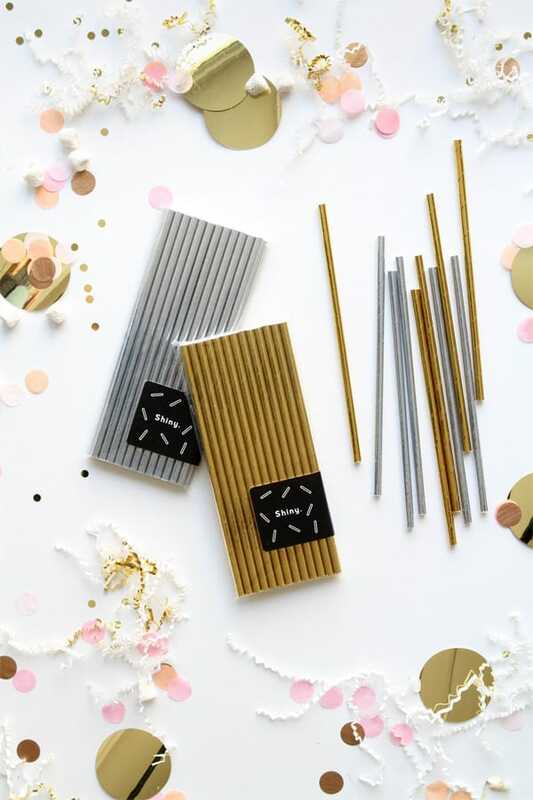 Get a modern and sleek pack of metallic straws to bring some more excitement to any party.